Preheat the oven to 150C/300F/Gas 2. Place a 25cm/10in dinner plate on a sheet of baking parchment and draw around it. Turn the paper over, and set to one side. Put the egg whites in a large, clean bowl and whisk with an electric whisk until stiff but not dry. They are ready when you can turn the bowl upside down without the eggs sliding out. Gradually whisk in the sugar, a tablespoon at a time, whisking for a few seconds between each addition. Adding the sugar slowly helps to build up volume in the meringue and make it stiff and shiny. Finally, whisk in the vanilla extract and cornflour until well combined. 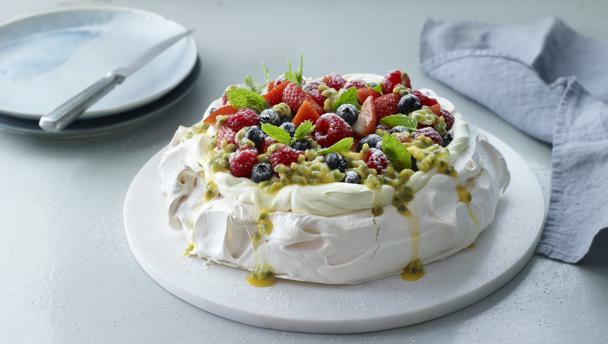 Dab a small amount of the meringue in the corners of a large, sturdy baking tray or sheet. Position the baking parchment, drawn side down, on the baking sheet, using the meringue dabs to secure it to the tray.You should be able to see the circle through the paper. Spoon the meringue into the circle and shape with the back of a serving spoon or rubber spatula to create a large meringue nest, with soft peaks rising on all sides. Place in the centre of the oven and bake for 1 hour until very lightly coloured and crisp on the outside. (If the meringue seems to be becoming too brown, reduce the temperature of the oven). After 1 hour, turn the oven off and leave the meringue for a further hour. Up to 2 hours before serving, carefully release the meringue from the baking parchment, using a spatula if necessary, and place onto a large serving plate. Whip the cream until soft peaks form and spoon into the centre of the meringue. Top with the strawberries, raspberries and blueberries, and the gooseberries if using. Cut the passion fruit and scrape the pulp over. Decorate with sprigs of mint and dust with sifted icing sugar to serve.